Tim Burton is easily one of the most commercially successful directors in Hollywood, with a name awareness up there with Steven Spielberg, Martin Scorsese, Quentin Tarantino, and Christopher Nolan. Yet in recent years, the director, whose new movie Miss Peregrine’s Home for Peculiar Children just came out, has been the target of plenty of scorn, too. Is he an underappreciated auteur, a self-plagiarizing hack, or something in between? Is Miss Peregrine a comeback or did he not really go anywhere? What’s up with how much the internet hates Alice in Wonderland? These questions and more are at the heart of our Tim Burton podcast, where Nathaniel, Marisa, and Jesse started with his new movie and wound up discussing every single feature he’s directed in some capacity. We talk about the best, the worst, the unloved and the underloved. Who sticks up for what? Who has a hot take on Charlie and the Chocolate Factory? And what have any of us bought at Hot Topic? Listen up and find out. 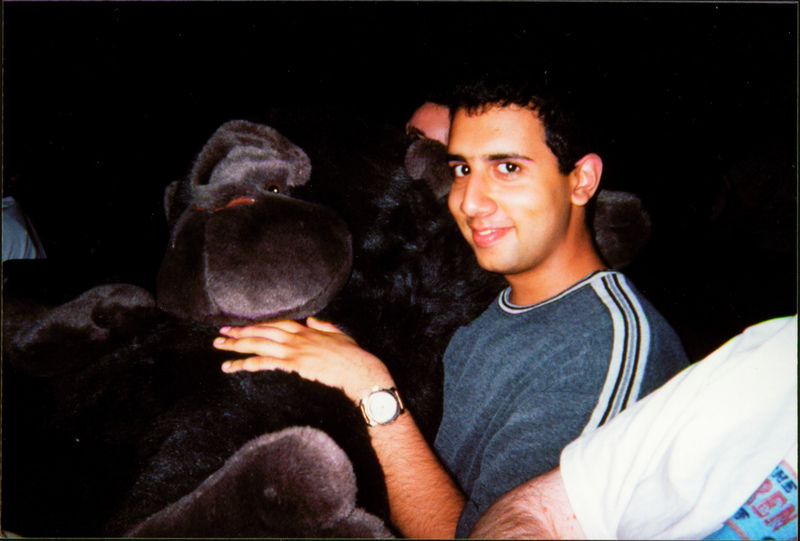 Rob and I were ejected from the Planet of the Apes (the movie, not the planet) in 2001. We got a chat going to explain what happened. When was the last time we IM’d each other? Probably sometime after we saw Planet of the Apes 2001 but also way before Rise of the Planet of the Apes came out in 2011. Right? A lot of these franchises get rebooted or whatever way too fast, but we straight up got into long-term relationships and got married in the lapse between Apes movies. Sabrina and I had been dating a few months. But I don’t know if she had yet to meet my parents when we first attempted to see the Tim Burton Planet of the Apes. I had met Marisa the spring before at school and we were chatting online a lot that summer. In fact I think her friends went to go see it the same night that we tried and I’m sure I emailed or IMed her about our misadventure. So this is a Google Hangout? First: background by way of what I’ve been listening to on a loop for the past 24 hours and am listening to RIGHT NOW: I got my cassette-to-computer device working and ripped the audio of Planet of the Tapes, the mix tape I made for the drive to Crossgates Mall to see Planet of the Apes (2001). At least the intro will be available as a download with the transcript of this conversation. Ugh, I prepped for this by listening to the Apes jams bonus tracks on Severe Tire Damage. I learned nothing. But SO DID I, because those bonus tracks are all over the mix! Weirdly, though I had only seen the 1968 original at the time, the two best They Might Be Giants improv’d Apes songs are in fact my two favorite Planet of the Apes sequels: Escape from the Planet of the Apes and Conquest of the Planet of the Apes. “This Ape’s For You” isn’t one of your favorite Apes movies? OK, so to fill in, Rob and I and our buddies did this thing where we made 30-minute tapes for the drive to Saratoga to Crossgates Mall outside of Albany, for the movies we were particularly psyched about. Our buddies was usually Jesse, Me, Chris, Jeff, and whatever girl had yet to realize we weren’t that charming. I was trying to remember what the other mixtape-worthy movies of summer 2001 were, and I’m pretty sure it was just Moulin Rouge! and A.I.… which is actually pretty spot-on. But in retrospect, it’s weird that Apes was the only really big blockbuster type thing that got the tape treatment that summer. Which actually makes sense because summer ’01 was a bunch of really uninspired sequels and also Michael Bay’s interpretation of Pearl Harbor. It ended up being low key as it was me, you, Chris, and Ofy. But the ape tape is important to the story. When I think about friends I’ve had throughout my life, one common thread that runs through all of them is the ability to get excited about something. The “something” is only of secondary importance (though I’m sure if you were passionate about something I find loathsome, a friendship might not work out). But the ability to get into something, feel strongly about it, argue about it, write about it, make lists about it, or just generally be about it is apparently something I find important in people. While it’s essential that you have the ability to get excited about something, it’s even better if you can muster enthusiasm for next to nothing. Which brings us to Tim Burton’s Planet of the Apes. If you recall—and Jesse and Rob get into this in more detail—in the summer of 2001, there wasn’t much to get excited about. Before Burton’s Apes, the big blockbuster-type movies that year were The Mummy Returns, Pearl Harbor, Atlantis: The Lost Empire, The Fast and the Furious (surprise hit! ), and Jurassic Park III. Okay, we also had Moulin Rouge and A.I., but it was a summer of slim pickings. I still went to the movies often, but there was not that much to really rev up the anticipation engine. With enthusiasm to spare and nowhere to direct it, and being a bunch of kids on college break living out in the suburbs, Burton’s Planet of the Apes became The Thing We Get Excited About among my friends. I don’t really remember how or why it was chosen. (I do have a theory about how suburban upbringings and unconditional love for Tim Burton go hand-in-hand, but that’s a different post for a different day.) I just remember that it was decided: We Will Go All Out for Apes. And we did. I love this photo, and not just because you can’t see me in it. First off, you can see that we got big group to go to the movie in the first place (six in the photo, me taking the photo, and at least one more in the photo below). If this movie came out today, I don’t know if I could scrounge nearly 10 people to go see it unless it had a good Rotten Tomatoes score. Also, we brought apes! And monkeys, of all sizes. (I’m pretty sure that purple one up front is mine, and his name is John Flansburgh because I bought him at Serendipity 3 after a They Might Be Giants concert.) One of my friends brought an ape so big, I was afraid they were going to make him buy a ticket for it. We were definitely Team Ape. You can’t see it in the photos I think a few of us even drew “GO APES!” on ourselves, homecoming pep rally-style. It didn’t matter that the movie wound up falling into the bottom tier of Apes movies and the bottom tier of Tim Burton movies. It’s pretty easy to find a friend that will go with you to a critically acclaimed, Oscar-preordained, box office smash. 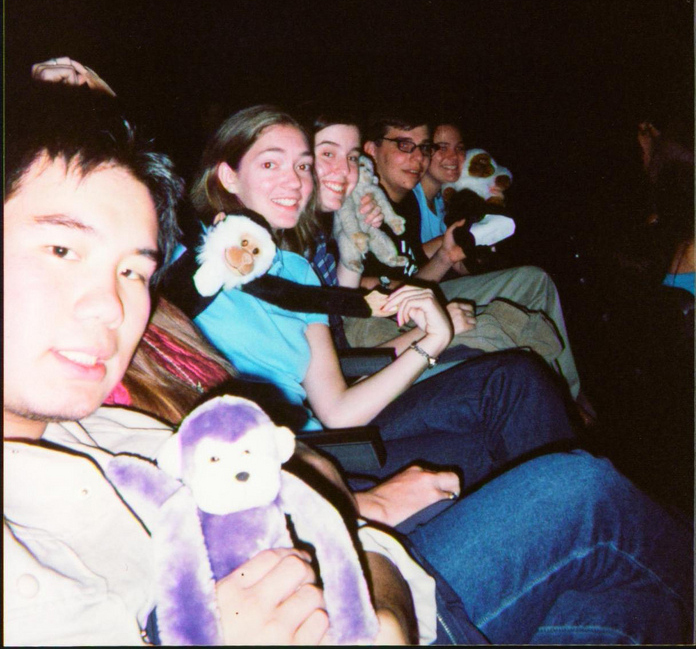 But if you find people who will go with you to a possibly junky, head-scratching Mark Wahlberg vehicle—and bring stuffed animals, and write on themselves, and generally root for the apes, well, then, that’s a friend for life.